How do men think about fathering? How does this differ across different regions of the world? And what effect does this have on child development? 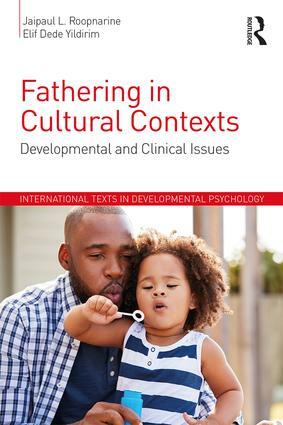 Fathering in Cultural Contexts: Developmental and Clinical Issues answers these questions by considering a broad range of theoretical and conceptual models on fathering and childhood development, including attachment theory, developmental psychopathology, masculinity and parenting typologies. Roopnarine and Yildirim provide a comprehensive view of fatherhood and fathering in diverse cultural communities at various stages of economic development, including fathers’ involvement in different family structures, from two-parent heterosexual families to community fathering. This book’s interdisciplinary approach highlights the changing nature of fathering, drawing connections with child development and well-being, and evaluates the effectiveness of a range of father interventions. Fathering in Cultural Contexts will appeal to upper level undergraduate and graduate students in human development, psychology, sociology, anthropology, social work, and allied health disciplines, and professionals working with families and children in non-profit and social service agencies across the world. Jaipaul L. Roopnarine is Pearl S. Falk Professor of Human Development and Family Science, Syracuse University, New York, USA, and Professor Extraordinary of Developmental Psychology, Anton de Kom University of Suriname, South America. Elif Dede Yildirim is Assistant Professor of Human Development and Family Studies, Auburn University, Alabama, USA.